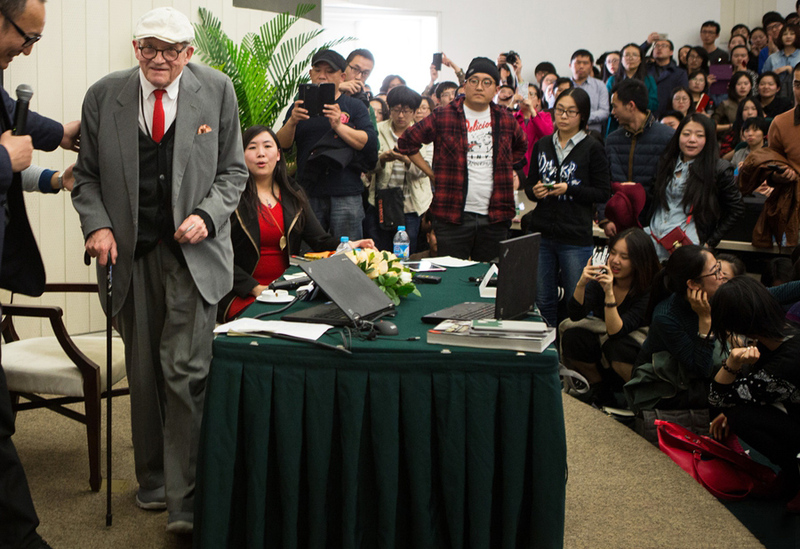 At 4:00 pm on April 13, 2015, jointly invited by the Center for Visual Studies at Peking University, Chinese Modern Art Archives, Modern Art Society at Peking University, the famous British artist David Hockney gave a lecture at the Alibaba Auditorium on the first floor of building 2, Guanghua School of Management at Peking University. 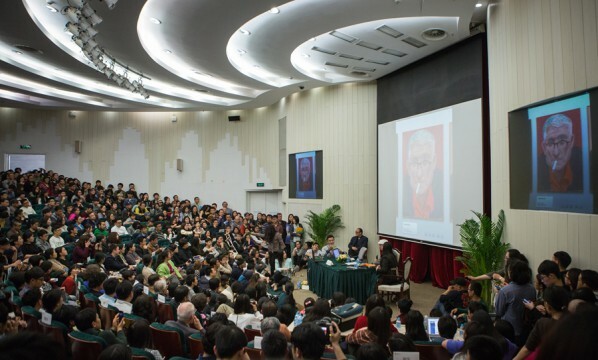 Entitled “On the Establishment of the Contemporary Aesthetic Perception”, the lecture was hosted by the Department of History, Peking University, and presided over by Professor LaoZhu from Peking University. The lecture drew a large number of audience and the room was crowded with enthusiastic fans. David Hockney is as one of the most influential international painters today, producing vivid images that are highly recognizable over the last 50 years. His works use a variety of mediums, covering oil painting, watercolor, photography, printmaking, etc., and it is interesting that he recently he has used an iPhone and iPad to create art. 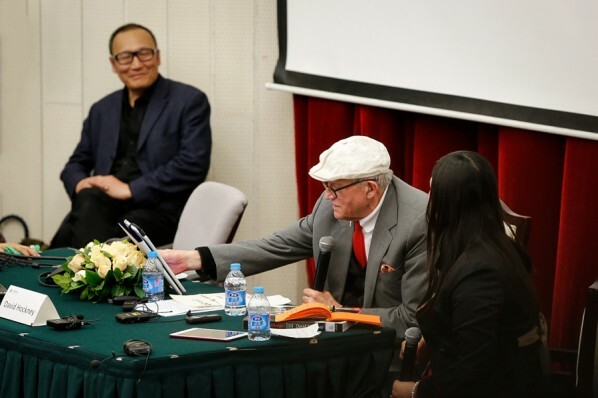 In the lecture, Hockney mainly talked about his solo exhibition which is going to be held in London, UK in May and he showed the images and video materials relating to the exhibition. Firstly, Hockney explained the“reverse perspective”, namely changing the single perspective of the viewer, using a variety of perspectives in the same painting, so that there was much more detailed information in the picture and also he emphasized the spirit of realism. Hockney said images usually only used a type of perspective, and linear perspective should be reversed. Hockney used pictures to showcase the effect of the ‘naked eye 3D technology’, namely there were different perspectives of different objects so that one could not only see all objects in the images once, instead viewing the images one after another. Hockney took the figures in the images as examples, and said each figure assembled about 10 photos, in order to create the 3D effect. Hockney said it used the tradition of Chinese scroll painting, and its variable focuses stopped the viewer completely seeing all the information of the painting in asingle time frame. Then Hockney showed a 9-minute film, which used the perspective of scroll painting, rather than the skill of photography. The film was shot by multiple cameras at the same time, not only were the figures dynamic even the background was mobile, the figures were thrown and caught as a variety of things in the film, to express the concept of “movement” in the movie. He believes that he should use multiple cameras at the same time to save the current difficulties faced by photography and film, using only one machine, the perspective was always single, anti-Cubism, the issue of “perspective” was perhaps ignored by a lot of people. 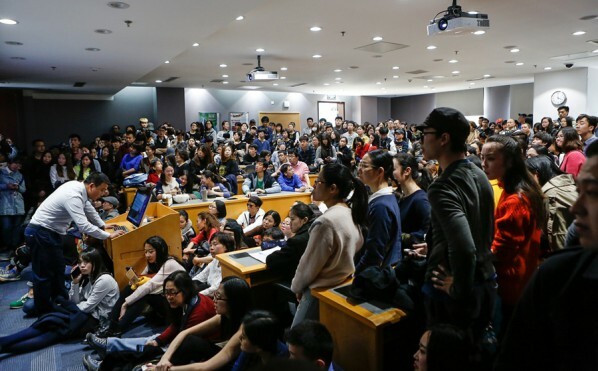 Then the lecture entered the Q & A section, part of the questions came from the contributors of the network, while some came from members of the audience.